4330. Abbey of the Bodhisattva Joodoj: An abbey dedicated to Joodoj, the bodhisattva of vegetation and fertility, has been constructed here at the head of a wooded valley cultivated by the fourteen nuns of the abbey and their abbess, Baatai. The valley’s has terraced fields growing the five sacred grains and rutabagas. Baatai is the abbess of the monastery. She is a plump woman of sixty winters with high cheekbones and vibrant green eyes. Cynical and taciturn, she does not welcome strangers to the monastery, though she will provide hungry strangers with boxes of steamed rice and vegetables and skins of water and then send them on their way. She and her priestesses wear green robes and wear their hair in thick braids that they pile atop their heads like coiled snakes. |	Baatai, Wushen Lvl 9: HP 38; AC 9 ; Save 6; CL/XP 10/1400; Special: Spells (5th), turn undead, special move, special move, elemental spirits. Equipment, prayer beads. 4348. Weasel Shrine: In a gaudy shrine of brass and pine painted bright red there lives a giant weasel. The weasel commands a flight of twenty flying monkeys to forces travelers to visit his shrine and pay a tribute of foodstuffs and gold. The weasel is actually a disguised dragon, Yardoc, a huge, young wyrm that looks like a 20 ft long, one ton serpentine toad colored a brilliant scarlet. A massive boulder located about 90 yards north of the shrine in a hollow hides the dragon’s treasure in a pit. It consists of 290 pp, 4,530 gp, 440 sp and a coat of fox skins worth 100 gp that makes on immune to illusions. | Yardoc: HD 11 (11 hp); AC -2 ; Atk 2 claws (1d4), bite (1d6) and tail whip (1d6); Move 10 (F10); Save 4; CL/XP 15/2900; Special: Breathes a giant wad of goo that hardens on the skin and reduces movement by 3 and AC by 1 with each hit, the goo is dissolved by alcohol, surrounded by a thick fog (as fog cloud) that forces those who breath it to save vs. disease. 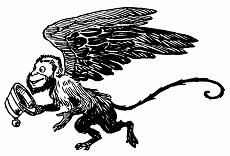 | Flying Monkey: HD 2+1; AC 6 ; Atk 2 claws (1d3) and bite (1d4); Move 9 (F18); Save 16; CL/XP 3/60; Special: If both claw attacks, the monkey can grasp and lift the person, rising 10 feet in altitude per round.